I took the opportunity to try my hands at making puff pastry from scratch when I was on vacation as the weather was quite cooling and I assumed that the dough wouldn't be sticky and messy to handle. I could make both oil and water dough easily and there were no 'sweat and tears', LOL! The pastries turned out nice and flaky and everybody gave their thumbs up for this dim sum, especially my dear grandnephew who asked for more! Water dough - Sieve the plain flour into a mixing bowl, add in the slightly beaten egg yolks, mix well, add ice cold water gradually,( you may not require the whole amount of water as too much water can make the pastry tough), mix well and form into a dough. Wrap up with clingwrap and keep in the fridge for 30 mins. After 30 mins., roll out the water dough, place the oil dough in the centre and wrap it up like in the above picture. Wrap with clingwrap and keep in the fridge for 30 mins. After 30 mins. roll out the dough and fold into three like in the above pictures. Wrap with clingwrap and keep refridgerated for another 30 mins. Repeat this step (3 layers) one more time. Wrap up the dough and keep chilled for another 30 mins. After 30 mins., roll out the dough and this time fold into 4 layers, like in the pictures. Wrap up and keep chilled for another 30 mins. Roll out the dough, cut with a pastry cutter. Lightly press the dough onto lightly greased tart moulds, prick some holes with a fork. Keep these 'pressed tart moulds' in the fridge for about 20 mins. Retrieve from fridge and pour in the egg custard, 3/4 full. Bake on the lower shelf of a preheated oven @ 180 deg.C for 25 to 30 mins. Let cool in the tart moulds before unmoulding. 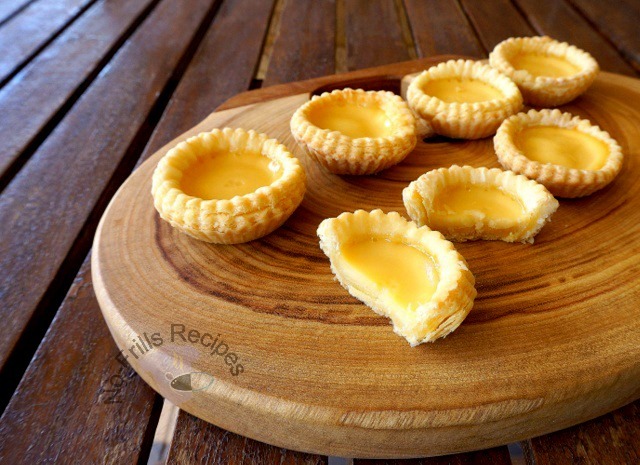 (Please check 'here' for details in baking these egg tarts). Boil the water with sugar till sugar dissolves. Let cool. Lightly whisk the eggs with the milk. Do not whisk till frothy. Add in the vanilla. Mix well. Pour in the cooled syrup, mix well. Strain the egg mixture twice and pour into a jug for easy pouring into the tart moulds. Yield : 12 pieces of 2.1/2 inch diameter and 9 pieces of 3 inch diameter. Ooo...look at those layers. This is absolutely beautiful! 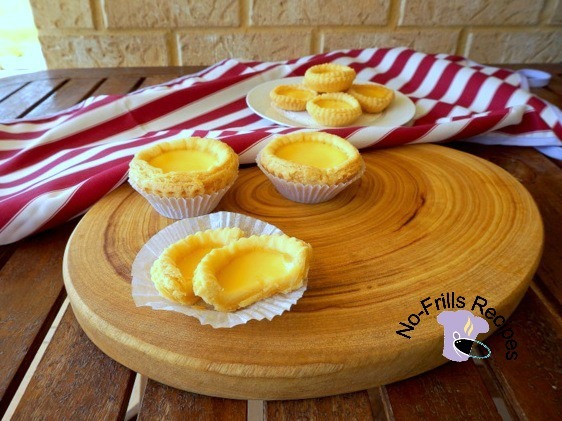 Whenever others post their egg tarts post, I will usually stop by to have a look but after seeing your gorgeous layers flaky egg tarts, I really wish I could stop by at your house instead!! Im really mouth watering now......yum!! Ha, Ha, Mel... Be my guest! 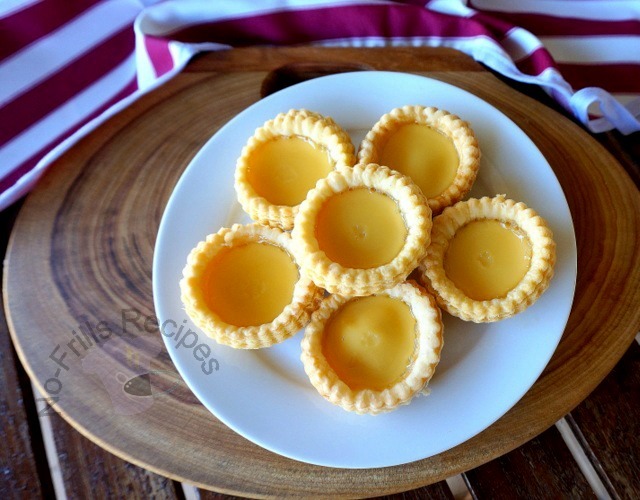 These egg tarts are very pretty and flaky! Looks so yummy too! Gorgeous crumbly layers! I would love one too. Please feel free to help yourself, Angie! Good day Cheah ! Goodie goodie.... your egg tarts look so awesome inviting. Very well done, love the layers. Wish I have these for my breakfast. Enjoy your day. Thanks, Kristy. You have a jolly good weekend too! You are a pro ... I am speechless! No, no, Janica, still learning each day! Cheah, thanks for the tutorial on how to roll the dough. It is quite a long process! I am interested to give it a go and will have to wait for a weekend when I don't have many activities. 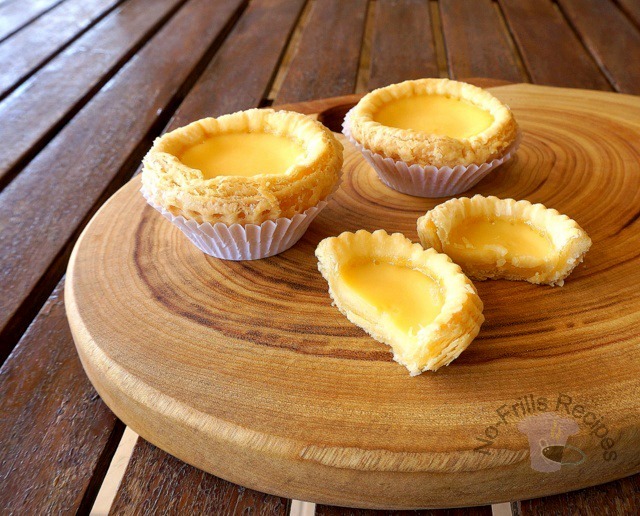 Your egg tarts and the flaky pastry look really good! Yes, must admit that it's tedious but when you see the layered pastry, you'd be so pleased! They can be quite addictive more so if taken warm! just want to ask you use salted butter or unsalted butter ? I used unsalted butter, think there's no harm if you use salted. How i wish i can a one from you. I will try your this recipe. Yes, you can use full cream uht milk. Castor sugar is used in the custard. Hi! I tried these Egg Tarts for Chinese New Year. It was amazing! The pastry turned out beautiful and there were so many flaky layers. This was my first attempt on Egg Tarts and my first try on puff pastry. My whole family loved them including myself. It would be great though if you could write down how thick the dough should be at the end of the process :) Thank you very much for this recipe! Hi Sharon, May I know where you buy the egg tart mold and the shape cutter. What size is the shape cutter in diameter. Thanks. Can you do this recipe in cups/tablespoons/teaspoons (US measurements)?